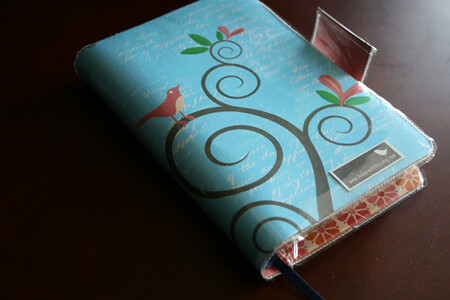 mah spanking new Bible cover. i needed something that could be easily cleaned so i opted for vinyl and to make it all the more awesome i used some scrapbooking papers for effect. i'm thinking a good way to finish this would be bias tape, and i still need to figure out how to close the flap. i'm thinking sticky velcro? i love how spring and pink it all feels. how do you sew vinyl? very annoyingly. actually, i usually tape all the surrounding areas that i'll be sewing on, even my machine's foot to reduce the friction from the vinyl. and then i guide it through by hand. i love it! simply adorable!!! what about eyelet holes and threading a ribbon through? T'is loverly. I like mgk's mom's idea of eyelets and ribbon. Well done, you creative bunny, you!